The Lotos MIG 140 is an excellent choice for amateur welders, DIY-ers, and professionals. It is easy to use, reliable, and versatile. The digital interface allows you to achieve exacting and durable welds for a variety of projects. There is a lot to consider before purchasing a MIG/flux-core welding machine. The first question to answer should be: What kind of jobs will I be using this welder for? What Is The Lotos MIG 140 Best For? The Lotos MIG 140 is capable of creating industrial quality welds at a great price. It’s easy enough to use for DIY-ers who work in the garage on projects or around the house to make simple repairs. It would also make a great machine for any professional shop. It is perfect for projects that require precision, since the 2 digital displayers help to adjust the wire feeder speed and voltage to give you the exact settings to produce strong welds. The machine is multi-use, which means it can be used to weld stainless steel, mild steel, aluminum (if you purchase a spool gun separately), and other metal materials. From decorative metal work to car repairs to professional fabrication jobs, this machine does it all. The digital wire speed display prevents pesky wire tangles. The 2T/4T switch and 2 displayers gives you complete control over your speed and voltage. It is a highly-customizable machine that puts you in the driver’s seat, allowing you to adjust for different materials and uses. The machine can be set up in 10 minutes, according to the manufacturer. Simply connect it to a 110V wall outlet and start welding. The interface is very user-friendly for first-timers, but has enough settings to please professionals. The added thermal overload protection systems makes it easy for you to weld for long periods of time with minimal safety concerns. While this isn’t the lightest machine on the market, weighing in at 54 lbs, it is still light enough to transport easily. It can be taken to different job sites or back and forth from the shop to the house. It is durable and industrial grade without sacrificing the option to transport if necessary. If you are looking to weld aluminum right away, you will need to purchase a spool gun in addition to the machine. It is the one accessory that does not seem to be included. Since the machine is so affordable, this isn’t much of a deal breaker. The machine comes with a 30-Day warrantee that promises you 100% satisfaction or your money back.This gives you a chance to use the machine and see how you like it before committing to long-term use. There is an additional 1-year limited warranty included with your purchase. The 1-year warranty comes with parts and labor for any manufacturers defects or issues you might experience with the machine. 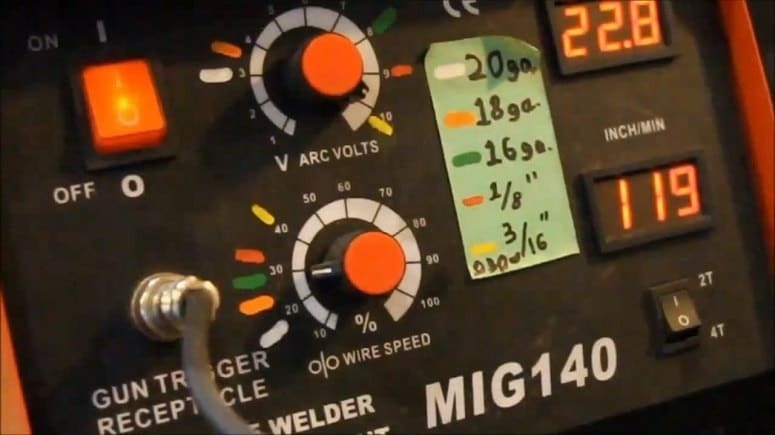 The Lotos MIG 140 is an excellent choice for amateur welders, DIY-ers, and professionals. It is easy to use, reliable, and versatile. The digital interface allows you to achieve exacting and durable welds for a variety of projects.